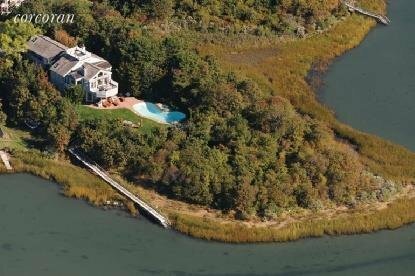 Minutes outside Southampton is this beautiful newly renovated bayfront home on a private 1-1/2-acre site with open bay views leading to the ocean. Long drive leads to a sunny, beautifully furnished home with incredible waterviews. Two master bedrooms, and 2 guest rooms, media room, large open kitchen, roof top deck, office, living room with fireplace and a large den. The outside has a stone patio and gunite pool and spa with waterfall. A truly beautiful spot.